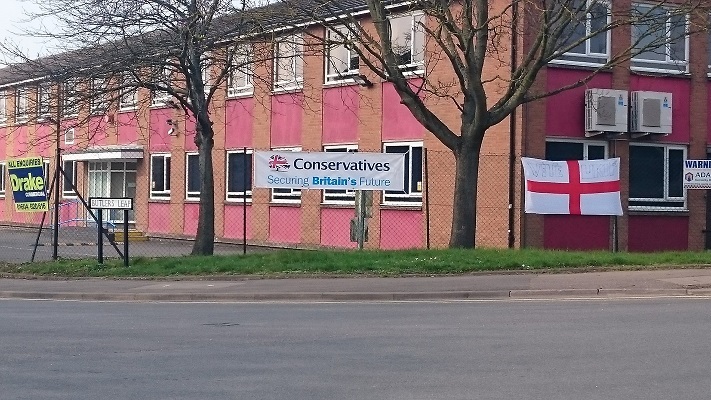 Rugby seems to have developed a rash of Tory banners – expensive looking durable ones – put up on road junctions and the like. But should they be there? As can be seen, someone has vandalised it and the scraps are still there. The site is jointly owned by Warwickshire College and Warwickshire County Council (but it is up for sale). I can’t see the council giving permission for political posting on their property (they are pretty zealous about the use of lampposts), and I doubt the College would either. EDIT 9/4 – Warwickshire College inform me that the land was sold to Bellway Homes East Midlands in November (not sure why the for sale boards are still there nearly 6 months later). You can just make out on the right that someone far less official has put up a St George’s flag and scrawled “Vote UKIP” on it, presumably in response. What is fantastic about the site is that it is on the corner where Rapak used to be. The place was shut down last year after the owners moved the work to Bulgaria. Kind of puts an ironic spin on “Securing Britain’s Future” to advertise at a closed business. Drakes, the agents acting for the owners of the Rapak site have told me they are not aware of any permissions to use it for political advertising. Bob Blackman reminds me of someone a little closer to home: Martin Heatley. Neither is fit to wipe Bert Crane’s shoes. Dan Byles MP – did he benefit from Lobbett’s claims? 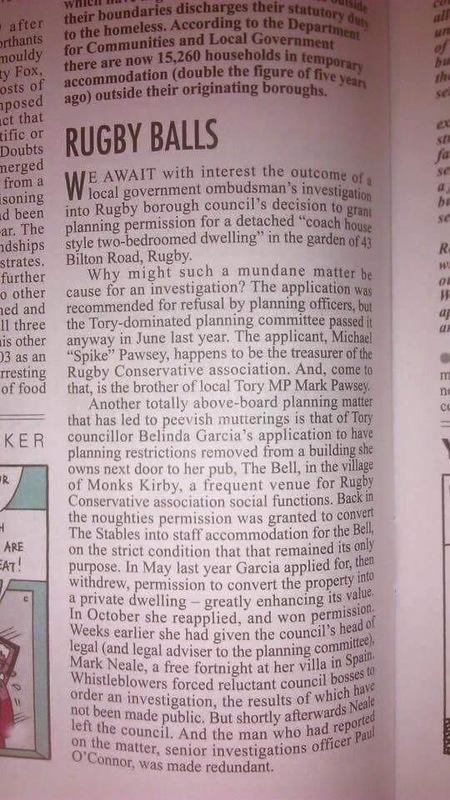 When I looked up the Tory candidate in the 2010 General Election, the one who won by a margin of 54 votes and who was being backed by Barry Lobbett, who was getting Warwickshire council tax payers to subsidise his campaigning, I found that he was being highlighted for his election spending last year. 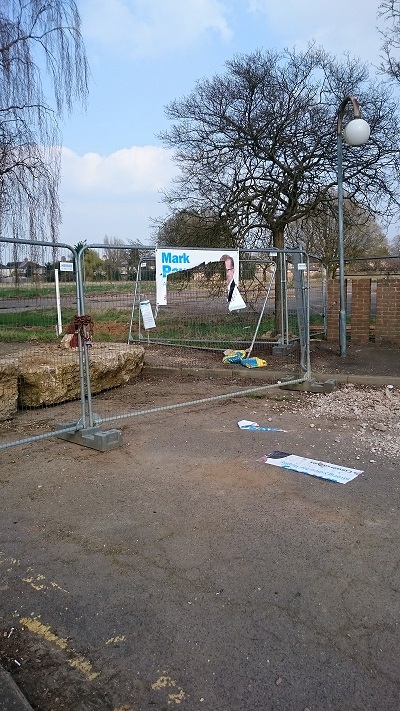 Then, it was a question over whether buying a new hoarding with his name, face and the 2010 election slogan should be fully charged to his 2010 election campaign or (as he actually did) only a third of it need be – with the remainder to be charged to future campaigns we assume. The difference was between £1600 and about £500, and had the larger figure been used, he would have been in excess of his allowed spending. In the end, there was no action taken against Dan Byles on the basis that it is ok to shift the cost over future campaigns, and he remains the MP for Warwickshire North and Bedworth. However, we now know that during the same ‘short campaign’ period, claims were being made to Warwickshire CC for a councillor to drive to events in support of the election campaigns for that councillor and for Dan Byles. Given that Cllr Lobbett feels he should be recompensed, what would be the effect if Byles’ campaign paid the costs? Would it tip the amounts over the legal limit? At the very least, Byles could do worse than distance himself from the penny-pinching councillor.